I was in Istanbul, Turkey on Friday night, about to catch a flight the next morning from the airport. I was staying with my sister who works for TRT World (the Turkish Government News Channel in English). Around 9:30 PM we learned that a group within the Turkish military was trying to take over the Turkish government: a coup attempt. 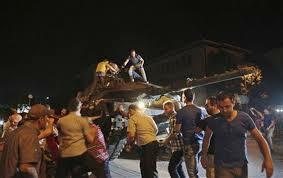 This group bombed the Turkish parliament in Ankara and took control of the bridge over the Bosporus Sea in Istanbul. The airport I was to fly from was closed down. This group also took control of the TRT news channels. An anchor woman was forced to repeat on the news channel that this group was now in control of Turkey. Using social media, Turkish President Erdogan urged the Turkish people to take to the streets in defiance of this attempted coup. At first, I thought that this was putting lives in danger, but then I realized that an overthrown government would also place lives in danger. The streets flooded with thousands of people, civilians, willing to die for truth and justice. Men, women and children flooded the streets and climbed on the tanks of the traitor soldiers. Some people died and many more were injured. I was struck by the courage of the Turkish people. They did not allow fear to stop them from standing up for truth. It didn’t matter what you looked like, what ideology you followed. Everyone was united against the coup. I stayed home with my kids while my husband and sister went out on the streets. We prayed and prayed for Turkey. Allah (swt) answered our prayers. It is only Satan that suggests to you the fear of his supporters, so fear them not, but fear Me, if you are (true) believers. Courage lies in the fact that we should fear only Allah and no one else. You will most certainly be tested by means of your possessions and your own person. You would definitely hear (many) hurtful remarks, (insults, and affronts) not only from those who were given the scriptures before you, but also from those who associate others with Allah. (Despite that), if you persevere patiently, and be pious, then that is indeed an act of courage and fortitude. One night the people of Medina were terribly frightened by a strange sound. Some people proceeded toward the sound. They saw the Prophet was coming from that direction. He had rushed before all others to find out what was the trouble. He was riding the horse of Abu Talha without a saddle and a sword was hanging from his neck. He was comforting people, telling them not to be afraid, and saying there was nothing to worry about. The Prophet risked his life before anyone else to investigate a loud and frightening sound in the night. The Prophet’s actions always spoke louder than his words. I love this mashaAllah. Jazakiallahu khairan sis. Wa iyaa kum dear Sister Shazareen. Thank you for your kind words! Alhamdulillah sister sheima I wast happy to have this website i learn a lot from you may Allah reward you with beautiful gifts in jannatul firdaus Your from Nigeria. Thank you Saeed for your kind words. May Allah (swt) reward you too with jannatul firdaus.